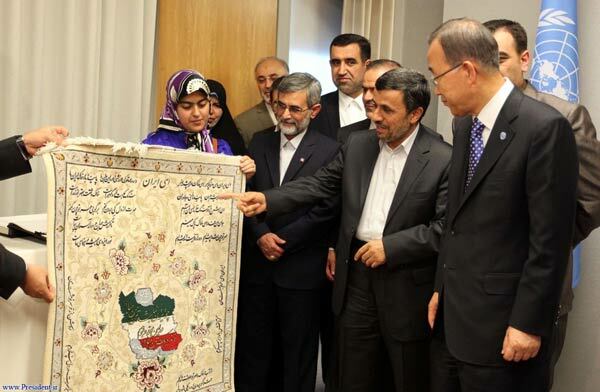 The "Mahmud Ahmadinejad Show" is off to a quick start, with the Iranian president revealing some fresh material as he prepares to address the UN General Assembly this week. Iranian President Mahmud Ahmadinejad meets with the press in New York. Ahmadinejad is well-known for using the general debates as an annual stage for political theater and abrasive comments. He wasted no time getting the ball rolling during a press conference in New York on September 24. "They [Israel] don't even enter the equation for Iran. What are these Zionists? Put a map of the world in front of you, put an atlas in front of you," Ahmadinejad said. "Iran has been around for the past 7,000 or 10,000 years. [Israelis] have been occupying those territories for the last 60 to 70 years with the support of force of the Westerners. They have no roots there in history." In addition to his frequent targets, Israel and the United States, Ahmadinejad also had some choice words for gay-rights activists, Syrian rebels, and "full-of-s**t" Iranian lawmakers. And following up on his assessment that the controversy over Iran's nuclear program "resembles a comedy," the Iranian president even tried out a few jokes of his own. Ahmadinejad has placed special significance on this year's event. Iran recently assumed the rotating presidency of the Nonaligned Movement, and upon taking up the mantel Ahmadinejad pledged to be a vocal leader for a grouping that represents the largest voting bloc in the United Nations. On top of that, with an election next summer spelling the end of Ahmadinejad's run as president, this week's general debates are likely his last opportunity to speak freely in New York as president. Thus far, Ahmadinejad has done his best to contradict a plea by UN Secretary-General Ban Ki-moon to avoid provocative declarations. 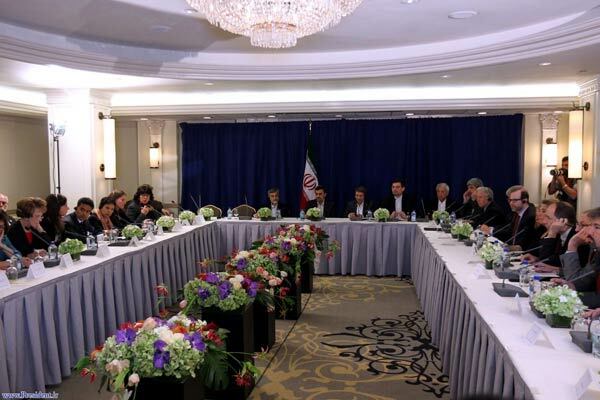 Facing off with some of the heavyweights of American media during an event at a New York hotel, the Iranian president appeared to relish the opportunity to deliver barbs. When asked about Israel's threats to carry out attacks on Iranian nuclear facilities, Ahmadinejad, 55, said he viewed them as a hopeless distraction. "Fundamentally, we do not take seriously the threats of the Zionists regarding an attack on Iran by them. Even though Iran, at the end of the day is a great country, and let me assure you, we do have all defensive means at our disposal and we are ready to defend ourselves, we do believe that the Zionists see themselves at a dead end," Ahmadinejad said. "They want to be adventurous in order to find a salvation, a way out of this dead end." About the whole Iranian nuclear issue, Ahmadinejad said it had become a "very tiresome subject. It has become one of 'one-upmanship' by these parties, so at the end of the day, I assure you, everyone knows that Iran is not seeking a nuclear bomb, and unfortunately, the scene resembles a comedy." There was time, however, to discuss Salman Rushdie, who has a $3.3 million bounty on his head as part of the 1989 death fatwa issued by Iran's late leader, Ayatollah Ruhollah Khomeini, for allegedly blaspheming Islam in his book "The Satanic Verses." When "The New Yorker" editor David Remnick asked Ahmadinejad whether the fatwa remained in effect, the president reportedly responded, "Where is he now? Is he in the U.S.? You shouldn't broadcast this for his own safety." It was not the only apparent joke to fall flat. "Why are you still calling the international powers negotiating with Iran on its nuclear program the P5+1?," Ahmadinejad quipped. "Even Iranian schoolchildren know that equals 6." The crowd's response? Dead silence. But Ahmadinejad was not done yet. As he headed out of the hotel, Ahmadinejad was questioned about the size of his delegation by a reporter from the BBC's Persian Service. "Mr. Ahmadinejad, the Iranian parliament said you obtained visas for 160 people," the reporter said. After Ahmadinejad ignored the comment, the reporter pressed on. "Mr. Ahmadinejad, why do you have visas for 160 people?" he asked. "Parliament is asking what these people are doing here." Turning momentarily to address his inquisitor, Ahmadinejad snapped back with the Persian equivalent of, "They (parliament) are full of s**t."
Speaking later at a high-level UN meeting on the rule of law, he condemned, without referring to any country by name, the United States for overlooking Israel's undeclared nuclear arsenal while attempting to sabotage Iran's nuclear program. 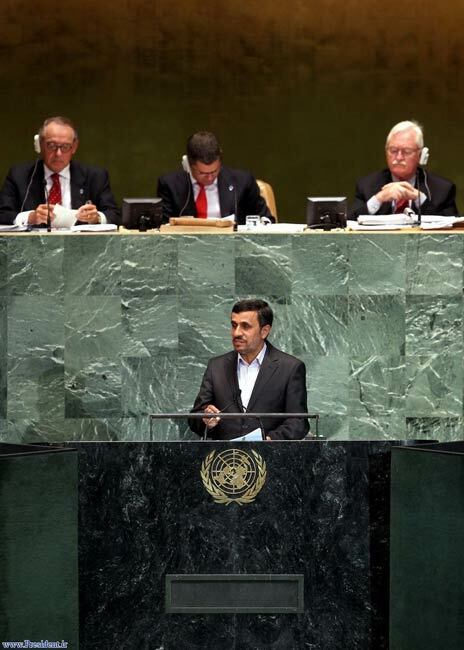 Iranian President Mahmud Ahmadinejad addresses the General Assembly's high-level meeting at UN headquarters in New York on September 24. "Some members of the Security Council with veto rights have chosen silence with regard to the nuclear warheads of a fake regime [Israel], while at the same time they impede the scientific progress of other nations," Ahmadinejad said. The remarks rapidly prompted the Israeli delegation to storm out of the UN conference in protest. And finally, in an exclusive interview with CNN's Piers Morgan, the president took a swipe at what he said was the West's lenient attitude toward homosexuality, which is forbidden by Iran's theocratic regime. "Let me ask you this," Ahmadinejad said. "Do you believe that anyone is giving birth through homosexuality? Homosexuality ceases procreation." "If a group recognizes an ugly behavior or ugly deed as legitimate, you must not expect other countries or other groups to give it the same recognition," he concluded.